Sold out dates and standing ovations... Everyone loves a success story and Dynamo's tale is just that. I zipped up to Manchester last week with Russ Stevens and Jamie Raven to see Dynamo Live at the 2,700 seat O2 Apollo. Dynamo covered all genres of magic, from intricate sleight of hand (projected on the big screen), to full-blown illusion, in an original production that really allowed the audience to get to know the magician that has been captivating them for years, via his hugely successful TV series, Dynamo: Magician Impossible. That's really what made the show and Dynamo stand out from typical large-scale type magic productions; the fact that we really got to know the performer. 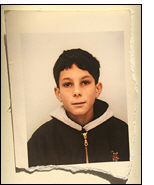 Here was the heart warming real-life story of a school boy who dreamt of becoming a magician, and did (and then some!). Dynamo and his production team rose to the challenge, that must have initially faced them, of "how to present 'TV street magic' on stage without it all turning into glitz?" and they got it just right. Do see this show. Dynamo is on tour until March 2016. See What's On or www.dynamomagician.com/tour for dates. DT. "Dynamo in Scotland: Magician wants to stay at Edinburgh Castle despite having dog on road with him" Click Here. "Dynamo adds raft of Belfast and Dublin dates" Click Here. The Magic Circle Awards Ceremony, Saturday 10th October 2015. The Devant Award for International Magic: Johnny Thompson MIMC. Awarded to those who have made a significant contribution in advancing the art of magic or who have given outstanding service to magic internationally. The trophy is a miniature bust of David Devant, the first President of The Magic Circle. The original life size bronze is on permanent display in the Headquarters. 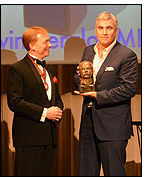 The Maskelyne Award for services to British Magic: Marvin Berglas MIMC. Awarded for services to British magic. The trophy is a sculpted head of John Nevil Maskelyne, founding father of a magical dynasty which presented magic in London for an amazing 60 years. Carlton Award for Comedy: Paul Zenon MIMC. Given to a performer for outstanding comedy in magic. The award is a framed portrait of Carlton, ‘The Human Hairpin’, who was Britain’s leading comedy magician in the early part of the last century. John Nevil Maskelyne Prize For Contributions to Magic Literature: Ian Adair MIMC. For noteworthy contributions by a member or non member of The Magic Circle to the art or literature of magic. Silver Wands awarded for service to The Magic Circle were awarded to Peter Pinner MIMC and Don Robertson MIMC. The Silver Wand, engraved with the recipient’s name, is given for outstanding services to the Society. The Cecil Lyle Award for best trick published in The Magic Circular: James Ward MMC. Given to the author of the best trick published in The Magic Circular during the past year. Called by the President of The Magic Circle, Scott Penrose MIMC to membership of The Inner Magic Circle with Gold Star: Jamie Raven MIMC.